PLEASE expect to pay an adoption fee for the Boston Terriers listed! Boston Terriers listed in red means we do have a current update on them and they are still available or are newly listed within the last week. 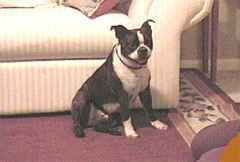 Boston Terriers with dates on them mean that we have no update on them and will be removed 10 days from the date posted unless I get an update. Looking for a Rescue Boston? Or know of a Boston that needs rescue? Please look at the NEW rescue contact page! AKC-BOSTON, FEMALE, 3YRS OLD. She needs a new home. Her ownerd have inquired her mothers 4 mini poodles and she is not getting the attention she deserves. She is an excellent dog, great manners, great with kids and other people. House-broken, Very affectionate. Please if you are interested, please call April at Amour Animal Center in Palm City, Florida for more information. 561-221-8591 ALSO 2 of the poodles are up for adoption in you know anyone who is interested. Please call or E mail to verify adoption status. mostly brown and blackmixed short hair.He weighs about 10-15lbs. This dog was found over a month ago and never claimed. The finder thinks he is about 4years old,good with kids and people and house trained. He is friendly and mellow . He now needs a home by June first at the finder is moving and Buster cannot go. 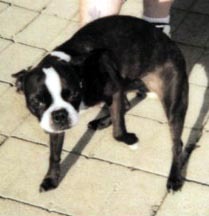 AKC registered Boston for adoption. Male, black & white, 2 1/2 years old. Great personality, very loving & playful. Neutuered, up to date on all shots. Please give me as much info about yourself as possible in your email. I would prefer a family situation in the Bergen County area of NJ. Let me know how many people in household, any other pets, how much time dog would spend alone (if any), what town you are from, etc. Please note: I will NOT respond to any emails that simply give a phone number or email address. I need to have some basic info to help me decide on an appropriate and loving home! Thanks! AKC Boston Terriers. 1-1yr.old. Has leg injury from birth. Limited white. A little shy but sweet. 1-8yr.old. Has alot of white. Very friendly and loves kids. Both females. Papers will be given when prove of spaying shown. Pet use only. No shipping. ALL fosters are fixed and vetted prior to adoption. Please fill out an application at http://www.geocities.com/bostonsos/test.htm Adoption fee to cover the cost of vet care. Mugsy is a ten month old neutered, male that has both rear patellas blown out. His first surgery is scheduled for Wednesday. They will be up to date on shots and heartworm when they leave for their new homes. He will not be adoptable for a while but when you see his picture you will be astounded that anyone could give him up. His personality is even better than his looks. Henry is a ten month old neutered, male. He will be up to date on all shots and heartworm before he goes to his new home. Henry bit a child so he can't be around small children. He's a very well behaved fellow. He is healthy and great with adults and dogs. Turned in by owner on 4-23-99 because he didn't like children. White with brindle markings. Longer muzzle than the traditional Boston has. About 8 years old and desperately needs a nice retired couple or family with older children to give him a good home. This is a very nice dog and in good health. Gets along with other dogs. He has been at the shelter so long, he has about given up on finding a home. When one of our volunteers tries to walk him, he won't hardly go past the building area because that is "home" to him. Brimley was surrendered by his owner, who had suffered a stroke. Brimley is a very unusual reddish-brown brindle color, and weighs in at 32 pounds! He is 6 years old and gets along well with other dogs. He loves to run and play, and should probably lose a few pounds!